Your values. What are they and how do they apply to your everyday life? Your values. What are they and how do they apply to your everyday life? Your values are what bring heart and meaning to your life. They are the bookends that inform your desires and your actions toward living a fulfilling and robust existence. They are also a measuring tool that let you know when things are “off-track” and offer an anchor with which to connect your choices to. Understanding what your values are about life, work, relationships and yourself will allow you to make more grounded decisions and will support you in committing to the decisions you make. Whether transitioning into a new job or out of a relationship – connecting the process to your values will bring much needed clarification and provide for a smooth and successful passage to the next stage of your life. The values I’m speaking of here are not your ordinary “laundry list” that you might expect. These “values” are not necessarily morals or spiritual principles laid down by the 10 Commandments. The values I’m speaking of are at the core of your individual being and are what feed the joy and exuberance of your life. What lights you up? What excites from the inside out? What contributes to your sense of well-being? What is present when there is synergy in your life? What, if taken away, would leave you less than whole? Knowing the answers to these questions offers a connection between what you are wanting from your life and the actions you must take in order to have what you want. 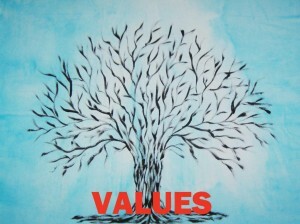 Your values may not be visible but the effect and impact of your values are. On a daily basis you are either living your values or you are not. When you are not living your values disharmony is sure to be lurking. If you are facing personal difficulties asking yourself the question, “Which of my values are not being met?” might be a good place to start in finding a meaningful solution. How does one discover what their values are? There are several techniques to do this but without having your own professional Life Coach to guide you and for simplicity purposes, we will stick with only two. The first method is called “Peak Experience” and in this method you will describe to a friend, partner or in writing to yourself, an experience in your life where everything was essentially perfect: from the company you were with, to the clothes you were wearing, to the weather or the light of day, to the way that you were feeling. Hold nothing back in your description and notice how good it feels to revisit this satisfying place. From here pick out what qualities supported this state of well-being. Was it that you were surrounded by people you love and those who love you? Were you out in nature and the profound beauty of it struck something deep inside you? Maybe you were lying in bed after a great nights sleep and the sun was casting a warm beam of light on your face? Was it that you accomplished something really big? Dig deeper. Pull out more from your memory bank and begin to make a list of qualities (a.k.a. values) that contributed to this sense of “rightness” in the world. Now, take those qualities and extend them even further. Say for example, nature is a value of yours – what nature means to you might be entirely different then what nature means to me. It’s important to clarify what it is about “nature” that makes it meaningful. Example: Nature = beauty/spontaneity/perfect order/humbling/etc. Do this extension with each of your core values. It’s a natural human instinct to be curious about ourselves so allow yourself to explore. 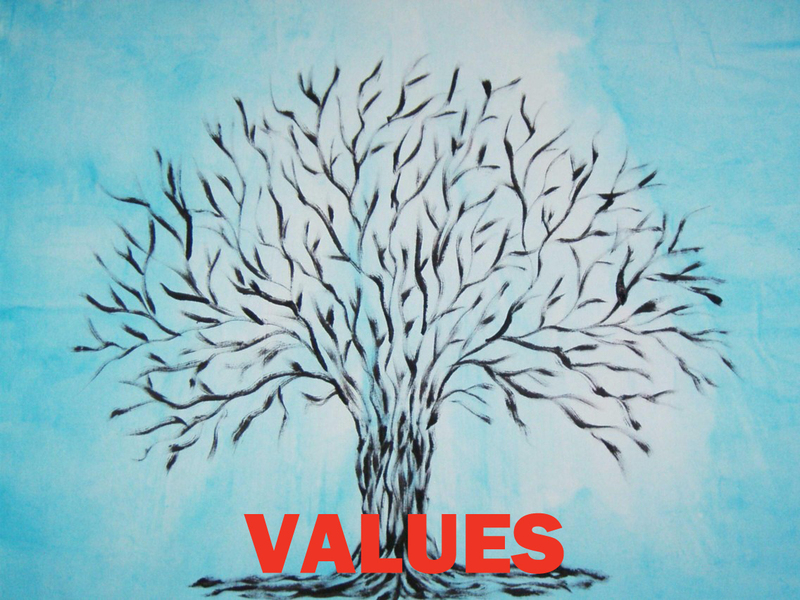 Understanding your values on a experiential level is both rewarding and beneficial as it leads to greater clarity and expanded personal freedom. The second method is more of a “back-door” approach to discovering your values. Here you are asked to speak to what it is that drives you crazy? What makes you most frustrated – with yourself? With others? When do you feel hurt by others and what is attributing to this? Most upsets occur because our values are not being met. These are known as Suppressed Values. Perhaps you are not being acknowledged at work for the great job you do, or you feel you’re not being “heard” by a spouse or close friend. These are perfectly honorable and essential values that are shared by many. Unfortunately though, these suppressed values go unrecognized so often they turn into resentment and blaming, a place where your needs will continue to go unmet. Be sure to extend these values out also. Example: Recognition & Personal Acknowledgement = it lets me know my efforts count/connects me to others/encourages me to want to do better/it feels good/etc. If you don’t know what your Values are and have never asked yourself these questions don’t worry, you are in good company. The fact is, the majority of people have never been through this process and live their lives without this profound personal knowledge which is immeasurably beneficial. Once you know what your Values are, your life will never be the same. Living your values will bring you increased joy and confidence in all areas of your life: it will simplify decision making as your choices will suddenly seem so obvious; it will bring a sense of freedom and relief as you finally begin to understand what it is that makes you tick; and it will add purpose and meaning to your actions because you will have built a foundation that guides and supports you in achieving greater personal fulfillment. What known Values are supporting you in your life? What suppressed Values can you give a voice to? How can you clarify these so they help you to make better decisions?